Purrfect Pals - $30 For 30 Years! Give $30 to Purrfect Pals to Celebrate 30 Years of Second Chances! Your Gift Will Help Us Save Cats and Kittens with Special Needs. 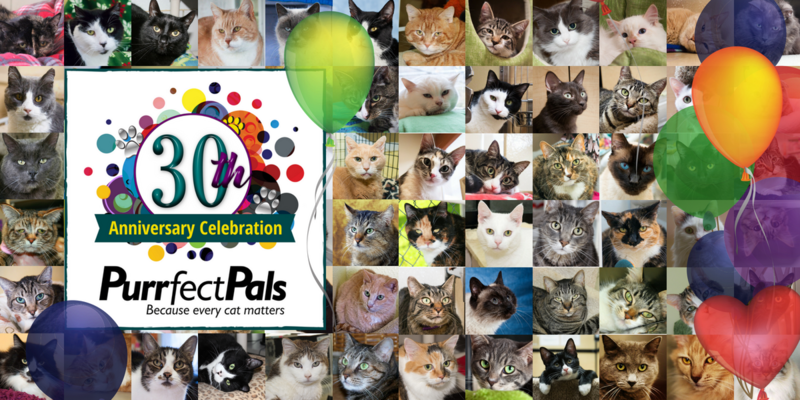 We're Celebrating the 30th Anniversary of Purrfect Pals! In 1988, a cat lover named Kathy Centala took a look around her community and didn't like what she found. She saw far too many unwanted cats and kittens whose only options were, in most cases, overcrowded shelters with high euthanasia rates. Kathy wondered what could be done to improve the odds for these cats. She decided that the only solution was to take away the option of euthanasia completely. Ignoring the critics who told her it wasn't possible, Kathy opened the Northwest's first no kill cat shelter and sanctuary. Thirty years later, Purrfect Pals still believes that every cat matters, every cat is adoptable and every cat deserves a loving home... especially those with special medical or behavioral needs. We fall in love with these special cats and kittens not in spite of, but because of their differences. To celebrate the past three decades and all that Purrfect Pals has accomplished with help from cat lovers like YOU, we're on a mission to raise $30,000 for special needs cats and kittens during the month of August. We're asking our friends to give a gift of just $30 to celebrate 30 years of second chances. Larger gifts will help us reach our goal faster, of course, but imagine the results if every cat lover we know gave $30! A very generous member of the Purrfect Pals Family has offered to match all "30 for 30" donations up to $3,000! That means your $30 gift will be doubled to $60 and $300 will become $600! Please help us reach our goal by giving a gift or sharing this link to our "30 for 30" Fundraising Campaign for Purrfect Pals today. Thank you! For all the cats who need homes, rescuing and care. I'll keep donating regularly. Carrying on the Kevin Sims legacy. He was the ultimate cat lover. It's simple. I love cats! I lost my beloved Ella in July 2017, but plan to adopt again. Ella was from Purrfect Pals. I love what Purrfect Pals is doing to help kitties! Because Every Cat Matters! For all the cats I cater to! For Emma, Christine and Vienna-you touched my heart and I miss you! I’m grateful for the opportunity to volunteer! Celebrating 30 years of the wonderful work you do for kitties. I love my two boys (adopted names Bagheera and Simba) I adopted from you in 2011. For all of the sweet kitties waiting for their furever home.